I am extremely excited to team up with JetBlue today! JetBlue’s annual, award-winning summer literacy program Soar with Reading is fantastic, and something I know you’ll want to hear about. JetBlue is working with Random House Children’s Books and bestselling author Mary Pope Osborne, known for her Magic Tree House® series, which features the adventures of brother-sister duo Jack and Annie, to help place age-appropriate books in the hands of children in under-served areas. 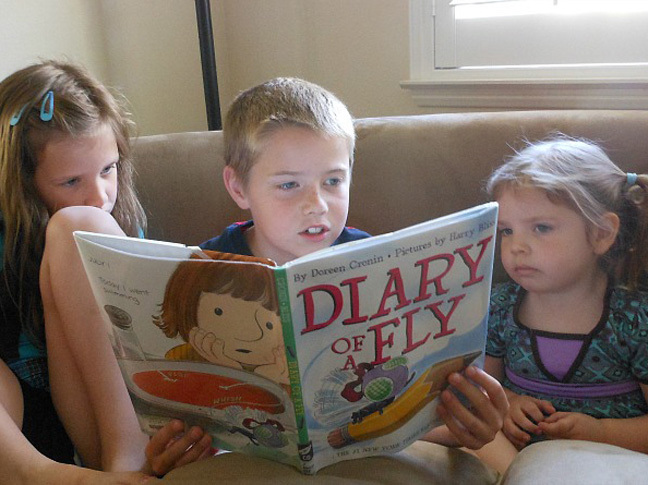 This summer, JetBlue needs YOUR help to make a huge impact on children’s literacy. With your support, JetBlue will donate up to $500,000 worth of books, host reading events across the country and launch a new mobile app with their Soar with Reading program. They have already raised over $230,000! Since I know reading is as important to you as it is to me… we are joining in with creative ways to get kids reading this summer. I’ll give you 5 tips and you add your tips in the comments! Sound like fun? Audio books are a great way to get reading in when you have a super-busy schedule. We’ve always loved audio books in the car. Not too long ago my sister and I took the kids on a day trip. All 5 kids…in one car. Yikes! On the way there they listened to Magic Tree House #46: Dogs in the Dead of Night and on the way back they listened to Magic Tree House #47: Abe Lincoln at Last! Can you believe it? Each book actually ended as we exited the freeway. It was such a nice way to entertain the kids, get reading in AND spend some chat time with my sister. *Extra tip: The audio books we listened to were a free borrow from our library. There is even an app on my phone. EASY and FREE! Can’t beat that. Adding an activity is a fun way to bring a book to life. The Soar With Reading site has some great Magic Tree House activity print outs. Some of our favorite book activities have been Charlotte’s Web pizza night, Magic Tree House “tree house” and It Looked Like Spilt Milk Paint Blots. *Extra tip – Sometimes it’s best to find the activity first! Does your family love soccer. Mary Pope Osborne has released a new book just in time for the 2014 FIFA World Cup. Magic Tree House #52: Soccer on Sunday will take Jack and Annie to a soccer field in Mexico where they must find the final secret of greatness for Merlin. On the field, they’ll meet a young soccer player who dreams of one day playing in the World Cup just like his hero, the great Brazilian soccer player, Pelé! This tip has a pretty funny back story. When Big M was first learning to read, I could not get him to pick up a book for independent reading. No matter what I tried I could not get him excited about reading on his own. One day my sister (who works as a parent helper in his classroom) told me he tested above grade level for reading. I could not believe it. Knowing that this was a challenge we were facing she questioned when he was practicing. His response? “My mom put books in the bathroom.” My point? Put books everywhere you can think of, you never know what spot will be the perfect spot to get your kids reading! Visit SoarwithReading.com to hear clues and make your guess. Use the Soar with Reading mobile app. *Extra tip – Use this cause as a launchpad into new interests. Does talking about under-served areas bring up questions? Do the kids want to know more about the clues Mary Pope Osborne gives? Make a trip to the library and fill your bookshelves with information. 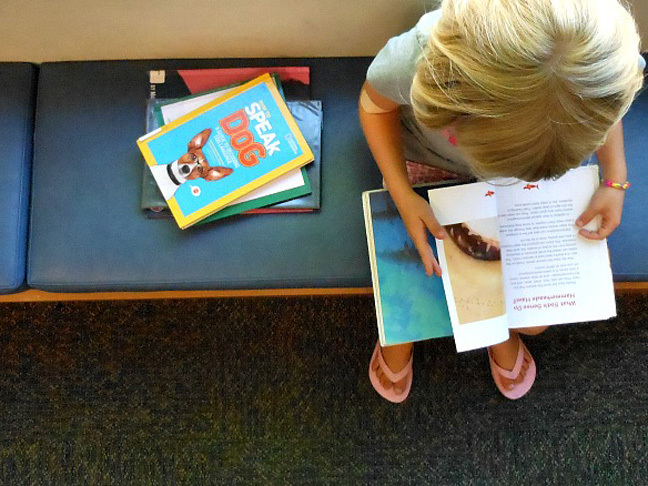 Alright, those are my 5 tips… it’s your turn to share your tips for getting kid to read. 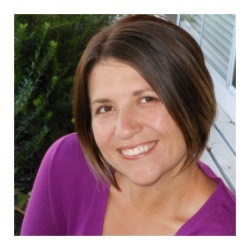 Jillian Riley is a writer who focuses most of her creative energy into her playful learning, playful parenting blog A Mom with a Lesson Plan. She is mom to an 8 year old son and a 7 year old daughter. Jillian is passionate about kid activities, learning and creativity! Find her on Facebook, Pinterest, and Google+.